First, I must say Hooray!!! Perseverance of real people fighting for their health and communities win a big one, beating back a ridiculous project that reeked of crony capitalism and corruption in the State of Indiana. Last, week, the Indiana Department of Environmental Management “revoked” the Title V and Operating permit for Indiana Gasification. I first learned about plans for a project called IGLLC from a press release issued on October 27, 2006 by then Governor, Mitch Daniels. Daniels outlined an ambitious schedule for the project’s development which called for the plant to be in operation by 2010. Valley Watch, of course, opposed the project almost as soon as it was known and joined by others, including Citizens Action Coalition, Spencer County Citizens for Quality of Life and Sierra Club came forth in a formidable coalition to oppose the plant. Vectren, the gas supplier for much of the state also joined the coalition during legislative battles in 2012 and 2013. 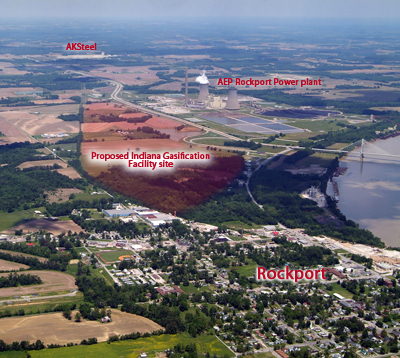 The proposed IGLLC site sat directly across US 231 from the AEP Rockport power plant and just down the road from AK Steel, which together already make Rockport. one of the most toxic polluted places on Earth. Photo © 2009 BlairPhootoEVV. Also, along the way, several pieces of legislation were passed to ease the progress of IGLLC’s owner, Leucadia National Corp., including laws that gave them eminent domain authority and the big one that made the State of Indiana its only customer, while requiring all the state’s residential and commercial gas consumers to pay a fixed cost more than twice the price of natural gas just for the privilege of getting their gas from coal. IGLLC had also been awarded the right to pursue a Federal “Loan Guarantee” to the tune of $2.8 billion plus the cost of constructing a 400+ mile pipeline to transport carbon dioxide from the plant to Jackson, Mississippi. Today, I was happy to inform the US Department of Energy’s front man for the project the permit had been revoked. Presumably that Loan Guarantee prospect will also go away. IGLLC caused me more than a few restless nights. From its inception, I was concerned that the political skids were so greased that it would be extremely difficult to stop the plant even though I also knew that its economics were doomed from the start. And that was when the price for natural gas stood at around $9/mmbtu and later rose to around $13 in 2008 when the plant was endorsed by the Rockport City Council (see video above). But I also knew that perseverance and organizing were the only things that can beat back a stupid idea that had so much political support. First, Valley Watch helped organize a cadre of local citizens who called themselves, Spencer County Citizens for Quality of Life. Already, people in and around Rockport knew that the prognostications of jobs and wealth for the community were not to be trusted. Already, those people had experienced the massive pollution and mistruths they had heard about both the AEP Rockport Power Plant and AK Steel. Already, Rockport was one of the largest, toxic zones in the world due to an enormous level of toxic pollution emitted from those two facilities. Valley Watch and SCCQOL working together with Citizens Action Coalition and later the Sierra Club, began to challenge every aspect of the plant, holding informational seminars and regular monthly meetings designed to show that “the people” did not want the plant built and would not allow it to happen. In December, 2009, DOE held what was called a “Scoping” hearing to ask what parameters should be investigated in the formal Environmental Impact Statement or EIS they would conduct for the project because it required such a huge Federal action. Opposition to IGLLC was readily apparent at that and subsequent hearings. As time moved on, the price of natural gas sunk to record lows and even today is only 42% of the price Hoosiers would have been forced to pay under terms of a one sided contract signed by the Indiana Finance Authority for thirty years, a contract that required Leucadia and IGLLC to do almost nothing to fulfill their end of the deal. It was in 2013 that things finally began to break positively for plant opponents. Legislation that would serve to obstruct the contract was offered to the legislature. With Mitch Daniels, the plant’s main booster since his first Chief of Staff, Mark Lubbers had become IG’s project director no longer Governor, opponents, with the help of Vectren passed the legislation. The legislation would not stop the plant but made it significantly harder for proponents to prove its veracity. Later that year, the Indiana Supreme Court gave the project new life by approving the morbid contract Indiana had signed earlier. It was also 2013 that I had the good fortune to attend the Leucadia Annual Meeting in New York along with Sierra Organizing director, Allison Fisher. There, we made the point to the new Leucadia management that they were in way over their heads and should reconsider their project. I also asked for a private meeting with Leucadia CEO, Richard Handler who was referred to as the “King of Wall Street” in several articles about him. Leucadia CEO, Richard Handler. Photographer unknown. It was September 18, 2013 that the meeting took place. He gave me one hour and I took only forty-five minutes to explain to him how he was placing his company at risk for total failure if he pursued the project. I gave him three documents: 1. The Duke Edwardsport Experience, which outlined the massive cost overruns experienced by Duke in their feeble efforts to build the Edwardsport Gasifier; 2. Leucadia’s Experience, which outlined the cost increases and other bad conditions like the public opposition already involved in the Rockport project; and, 3. Leucadia’s Risks which itemized thirteen significant risks the company would incur if they moved forward, risks that could actually cause the company to go bankrupt. I told Handler to not take my word for anything I had said but to have people “independent” from those in his firm that have skin in the game to check out what I said and then make a decision. He agreed. I walked out of that meeting finally confident that the project would be stopped but also knowing that it might take a while for an investment firm like Leucadia to walk away from a $2.8 billion Federal Loan Guarantee and such a sweetheart contract with the State of Indiana. 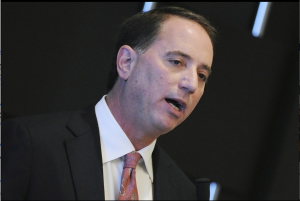 It is important to understand that in order for a small organization like Valley Watch to prevail against multi-billion dollar firms like Leucadia that we must always have the facts on our side and we must be willing to stay the course with a very long view. This is not the first long term project proposed by very large companies that Valley Watch has had the joy of bringing down. We actually cut our teeth on Marble Hill when we first formed in the early 1980’s. We had been fighting that nefarious project for four years before Valley Watch even officially formed. Finally, after eight years (1977-1984) we did prevail in that important battle which nearly forced then Public Service of Indiana into bankruptcy. Later, in 2001 we initiated the fight against Peabody Energy’s proposed Thoroughbred Power Plant in Central City, KY. In that seven year battle, together with the Cumberland Chapter of the Sierra Club, we brought Peabody Energy to its knees forcing them to abandon their 1500 megawatt, $4 billion+ behemoth after throwing numerous obstacles into their path. It should be noted that since the early part of this Century, we have lost two major fights since both the Edwardsport and Prairie State power plants have been constructed. But we need to also note that in both of those cases, huge cost overruns and numerous problems getting them started have proven us right from day one. I am sure that every one of those companies’ customers wish that Valley Watch and our coalition had been better heard. Valley Watch is extremely proud of the significant role we played ion each of those battles and particularly with Indiana Gasification. Break out the Champagne and let us celebrate today’s important victory, knowing full well there will be other battles ahead that we are uniquely prepared to take on. This entry was posted in Uncategorized and tagged Beyond Coal, Citizens Action Coalition, Coal, Coal gasification, energy, Indiana Gasification, junk economics, Leucadia National, Sierra Club, Valley Watch. Bookmark the permalink.